Sixth ANNUAL College of Engineering Networking Night! Thursday, April 7th from 5:30-7:30 p.m. in the Gunness Student Center in Marcus Hall. 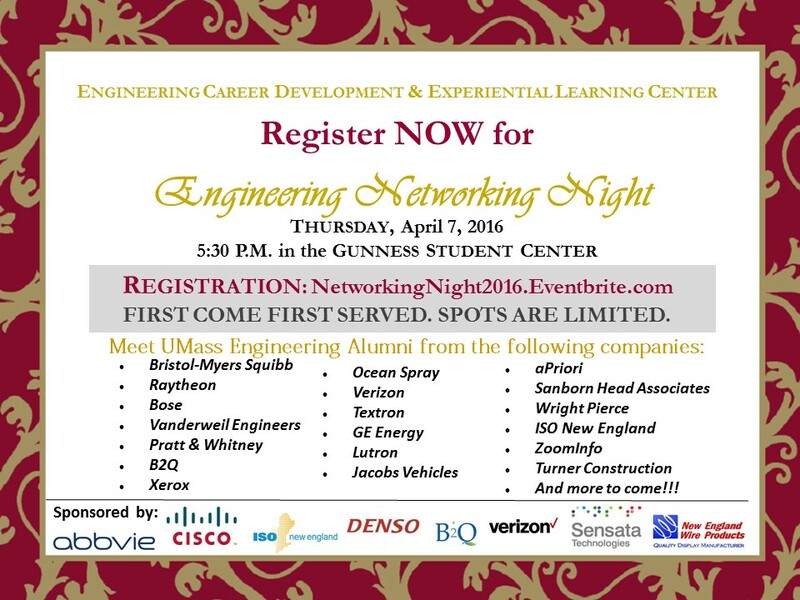 This very special evening, arranged exclusively for UMass Amherst Engineering students, offers a great chance to personally meet with UMass Engineering Alumni, hear about their career paths, learn of possible open positions within their companies and practice your professional networking skills. NOTE: This is not a recruiting event, so alumni will not be collecting resumes. However, it would be great to have business cards to exchange as you make these new career contacts. A simple business card could include the UMass logo, your name, major, Class of 20_ _, your email and cell number. Local copy shops can make these very inexpensively, typically with 24 hours.